Gov. Butch Otter will hold a town hall meeting from 1:30 to 2:30 p.m. Monday at the Wallace Inn, 100 Front St., to talk about the Lucky Friday’s closure and economic conditions in the Silver Valley. WALLACE – Mark Miller’s baby girl is just learning how to crawl. She has three rambunctious older brothers, ages 2, 7 and 9. 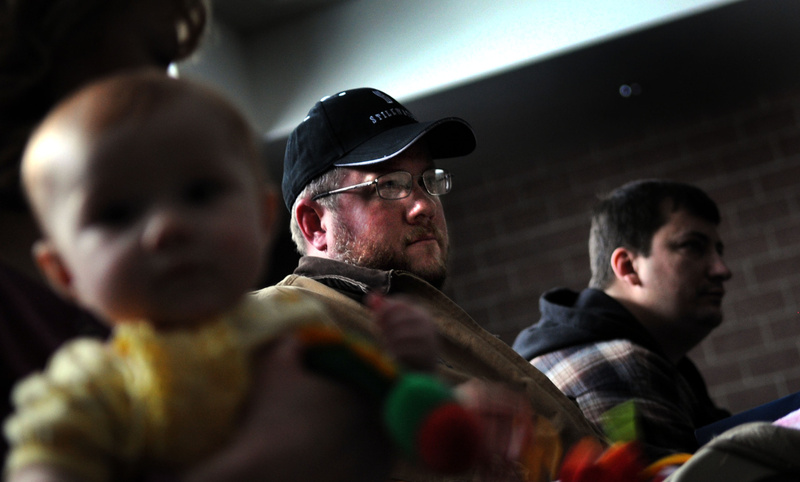 Miller hopes he can find a job in the area during a yearlong shutdown of the Lucky Friday Mine. But he may end up commuting to another state to work while his wife, Heidi, stays behind in the Silver Valley with the kids. The couple was checking out options Thursday at a job fair in Wallace. Several companies were recruiting experienced mine workers, but most of the openings were in distant states. Miller was among 185 employees at the Lucky Friday Mine who recently received a pink slip. The mine’s main shaft was closed Jan. 6 by the federal Mine Safety and Health Administration until repairs are made. Officials at Hecla Mining Co., which owns the Lucky Friday, said it will take about 12 months to comply with the federal order. The closure also affects 50 to 75 contract employees at the mine. Incomes in the Silver Valley could take a $25 million hit from the Lucky Friday’s temporary closure, said Alivia Metts, the Idaho Department of Labor’s regional economist. The figure includes lost wages plus the multiplier effect of that money being spent in the community. Record silver prices had brought a flush of prosperity to the Coeur d’Alene Mining District, which was reflected in workers’ paychecks. Last year, silver prices averaged $35 per ounce – a 74 percent gain from 2010. Miller, 39, earned $16 per hour in his job at the mine’s milling operation, but the rapid rise in silver prices significantly increased his paycheck. He also took home tens of thousands of dollars more in production bonuses and profit sharing. The abrupt loss of income is a shock to his family’s finances. Dennis Ballard and his wife were in the process of making an offer on a house when he was laid off. Ballard, 40, has applied for sawmill jobs but can’t find wages that would replace his income as a heavy equipment operator for Cementation, one of Hecla’s contractors. With sons ages 12 and 13, Ballard also hopes to remain in the area. He brought copies of his resume to the job fair. Seth Dinger, 34, and Anton Marek, 25, who were also at the fair, both found work at the K-2 Mine in Republic, Wash., about a four-hour drive from the Silver Valley. The men were mining partners at the Lucky Friday. One of their co-workers had accepted a job in Nevada beginning Monday. At the job fair, Barrick Gold was offering $5,000 signing bonuses to Lucky Friday employees willing to work at its Goldstrike Mine in Nevada. Coeur d’Alene Mines had openings at an Alaska gold mine. A Montana company was recruiting as well. U.S. Silver Corp., which operates the Galena Mine in nearby Silverton, Idaho, had one of the busiest tables at the job fair. About six former Lucky Friday workers have accepted jobs at the Galena. The mine currently has 290 workers but could absorb a few more, said Denis Asay, U.S. Silver’s human resource director. “Our goal, obviously, is to keep Silver Valley families in the Silver Valley,” he said. The potential for families to move to other areas could create hardships for Silver Valley schools, said Robin Stanley, superintendent of the Mullan School District, where the Lucky Friday Mine is located. Mullan schools have 120 students in grades K-12. If a dozen students leave because their families move, that’s 10 percent of the student body, Stanley said. The district would be forced to make significant midyear cuts. Every option is difficult for families, Stanley said: They can leave for other mining jobs; they can try to subsist on unemployment insurance until the Lucky Friday reopens; or a father can take a job in another location while the wife and children stay behind in the Silver Valley. Miller is a fourth-generation Silver Valley resident.